See how beautifully each line drawn comes together to form a wonderful woven pattern? This tangle truly lets you get into the Zentangle zone and it works up so fast! The second featured tangle I learned from this day was called Rick’s “Paradox”. 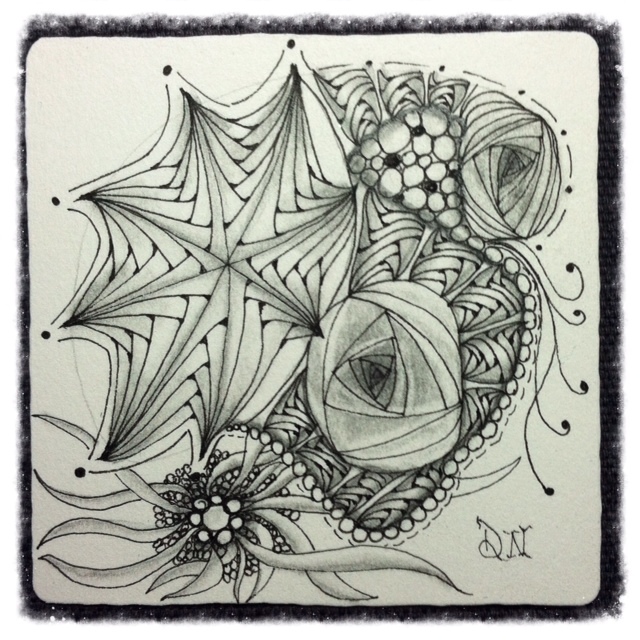 This fantastic tangle was created by fellow Zentangle founder and artist Rick Roberts. This particular tangle uses squares (or triangles variation) that slightly shifts inward as you move the tile around. This pattern creates a wonderful spiraling effect that creates depth. Instructions on how to draw Paradox can be found on the official Zentangle blog archives here. Together I think these two tangles work harmoniously together to create something magical. To add to the mystic of these tangles I added three favorites to compliment Betweed and Paradox which include Tipple, Squid and Fescu. I hope you enjoy these tangles as much as I do.